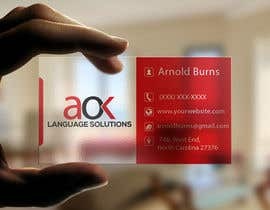 Our company is called AOK Language Solutions. This is a translation company, and we specialize in immigration law translations but we aren’t limited by it. Most of translations we do are in Russian because that is where we come from. The style and color scheme is up to the designer as we have no set preference yet, but no old school law, or rustic elements. Also please don’t do the whole, Russian and American flag. 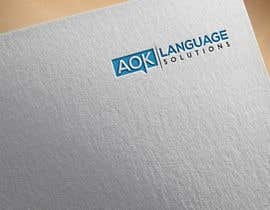 Logo can play on AOK, which the 'O' and 'K' stand for first names of founders, and also for 'OK'. I am l looking to create a couple of logos and design styles that I can use to produce a business card with. This same design cue will be throughout the website and everything with our name on it, from the folders with translations we give to clients to company vehicles. Please note I need the design of the logo, business cards, and a way to finalize the visual style of the brand (For example company folders that have the similar design look all over them, aka corporate identity) For the business cards, you can leave space holders for info such as email, phone etc... I can edit these in as needed in Illustrator. Please don’t hesitate to contact me for any questions, this way we are both on the same page. I like the entries but please note, that this isnt just to design a logo. It also includes business card design and branding. Check my entry #218, #219, #220. Sir, Please check my entry # 177, #178, #179 & #180 for your choice. what does A stand for ? Sir, please check my logo 171and 172. The color scheme should be bright, maybe mix of reds and whites. Sir, check my entry # 85, #86, #87 for your choice. Hello, check my entry #77 #81 I hope you like it. Thank you! Sir, check my entry # 73 for your choice. Check my entry # 64.